Readers seeking management careers in hospitality will enter a dynamic industry filled with opportunities. The rewards are many, but so are the challenges. Today's hospitality managers must deal with such complex factors as globalization, terrorism threats, ecotourism, internet commerce, new business and financial models, and rapidly changing consumer demands. Introduction to Management in the Hospitality Industry, Tenth Edition gives readers the industry know-how and the management skills needed to thrive in all aspects of the field, from food service to lodging to tourism. The Tenth Edition of Introduction to Management in the Hospitality Industry features both historical perspectives and discussions of new trends in a variety of sectors. This book has the most thorough coverage of the hospitality industry, covering foodservice, lodging, and travel and tourism, hospitality careers, and hospitality management. 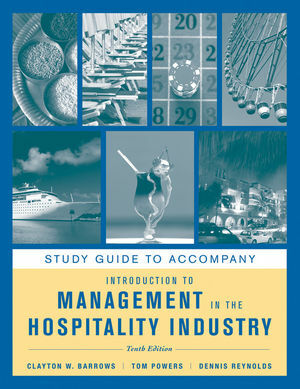 Readers will have a strong grasp of the many facets of the hospitality industry once they have utilized this textbook. Clayton W. Barrows is Associate Professor at the School of Hotel, Restaurant & Tourism Administration at the University of New Orleans in Louisiana. Tom Powers, widely recognized for his pioneering work in hospitality education, is Professor Emeritus at the School of Hotel and Food Administration at the University of Guelph in Ontario, Canada. Dennis Reynolds is the Ivar B. Haglund Endowed Chair in Hospitality Business Management at Washington State University. Previously, he was the J. Thomas Clark Professor of Entrepreneurship and Personal Enterprise at Cornell University's School of Hotel Administration. Chapter 5: Restaurant Industry Organization: Chain, Independent, or Franchise?